In the TV series, A Vicar’s Life you will have seen The Reverend Ruth Hulse – Team Vicar in the West Hereford Team Ministry and you’ll also have seen fleeting glances of The Reverend Prebendary Robert North. Rob is one of those very special people that make the world a better place. He is in fact, my TI – my Training Incumbent. The person whose job it is to attempt to shape and support me as I step through this stage of my training. Anyone who has ever had to work with me, or manage me knows what a big ask that is. I run at 150mph as my average speed. I run at almost everything with boundless enthusiasm and want to change the world through the action of God’s love in the world NOW. Rob has sat and listened, gently guided and stood in front of me, supported me, (and also said no) with a grace and kindness that I often don’t deserve. He is a model of what Christ’s love looks like in the world. You don’t get to see Rob in the TV series very much, which means you have missed the gift of this wonderful man – and so – for a moment when I have a degree of public attention I would like to turn the light towards Rob… a man I have come to deeply love and admire, a man who will make me a better Deacon, a better Priest and a better person. Last Sunday I was asked to do ‘GNS’ interviews for BBC Local Radio Stations. What that means in practice is that you sit in a small studio at your local station with a microphone and a small black box and every five minutes or so a BBC Producer from a different Local Radio Station calls you and you do an interview down the line. I spent two hours talking to stations all over country about what a huge privilege it has been to open the doors to the BBC Documentary team behind A Vicar’s Life. To show them, and in turn other people, what the daily life of a Church of England ‘vicar’ looks like. I did quite a few interviews but this one from BBC Radio Cumbria is a good representation. Why did I become a ‘vicar’? 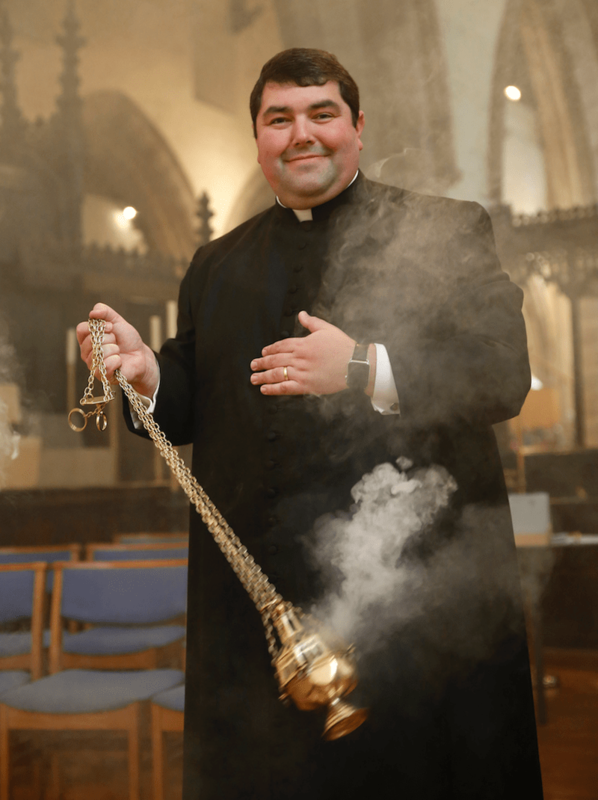 January 14, 2018 / Matthew Cashmore / Comments Off on Why did I become a ‘vicar’? It’s a bad title. 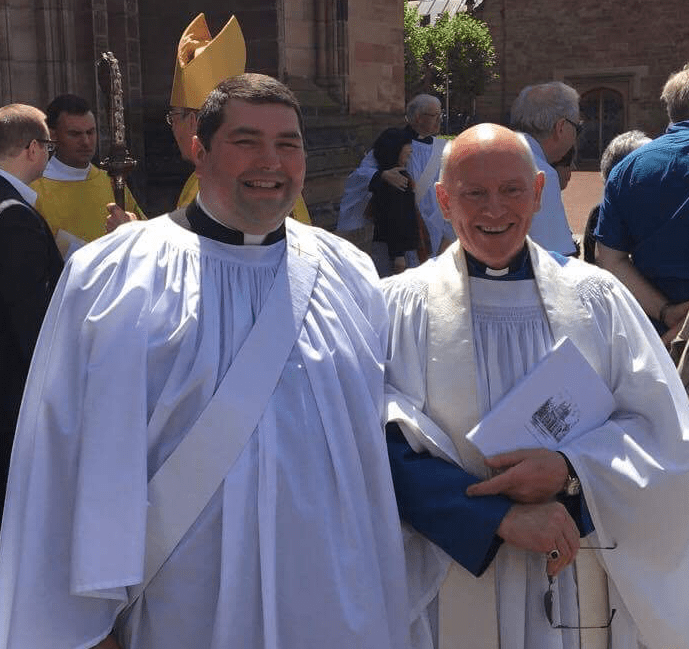 I know it is – I’m a Deacon on my way to becoming a Priest and if I am signed off from my training I may become a Vicar… or a Rector… or something else. Right now – I’m an Assistant Curate. 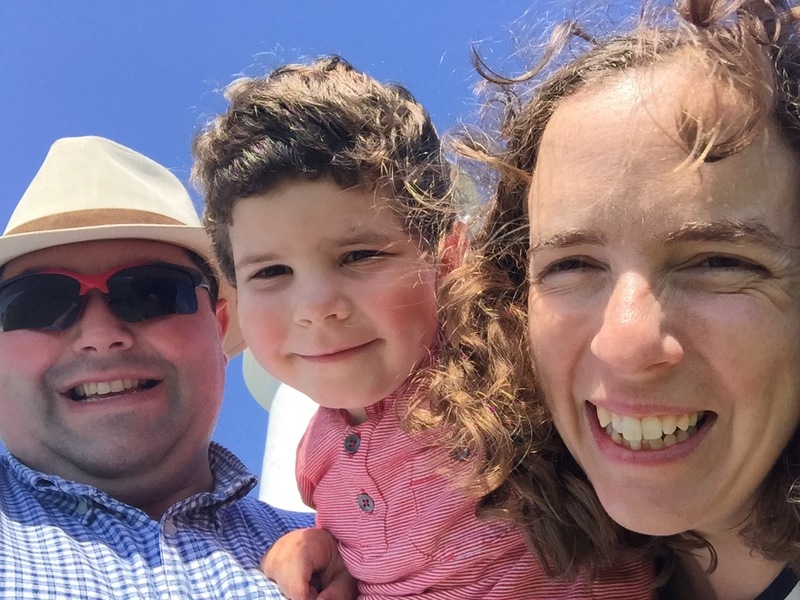 But this post isn’t about that – it’s about answering the question that has come up most often during the filming of A Vicar’s Life for BBC Two. It’s a question I answered for a Church of England video talking about my faith and calling which you can watch below. I hope it may help you start to perhaps look at what it is that God has in store for you. Welcome to the personal home of Father Matthew Cashmore. I write here about a range of things; a loose collection of posts and reviews about things that I am passionate about. For the most part that means you’ll see lots of posts about my faith and about Jesus’ ministry through me here at St. Mary-The-Virgin, Kenton. You can also find any sermons or broadcasts I may have delivered (although I’m not entirely consistent in posting them). Thought For The Week – BBC Hereford & Worcester – What are we called for? I was asked back (amazingly!) to BBC Hereford & Worcester to deliver a Thought For The Week. It’s a huge privilege to be able to speak to so many people about what it is that God may have in store for them – prompting people to sit in prayer and seek the path God has put before them. Listen to the Thought here, or read the transcript below and if you have questions about vocation then do get in touch. What are we called for? This coming Friday you will see me featured in the new BBC Two documentary “A Vicar’s Life”. 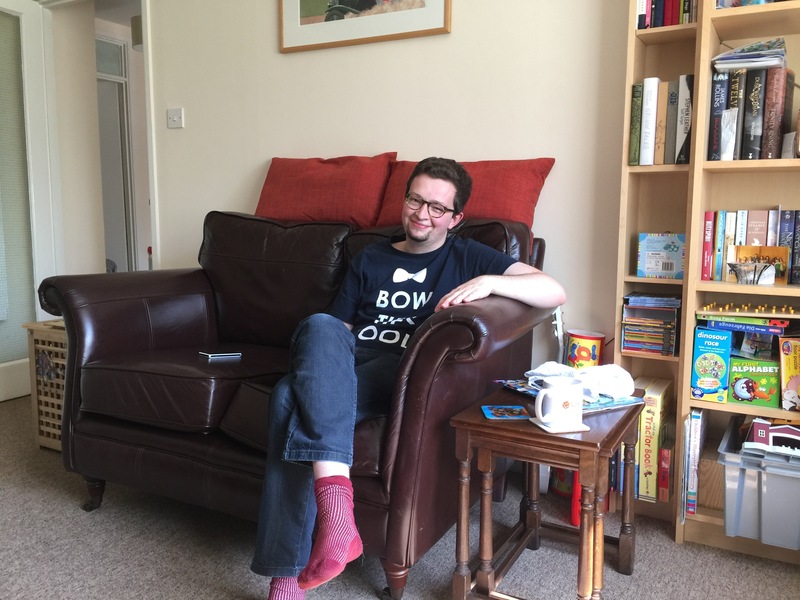 Amongst other stories you’ll see how I left college in Oxford and came to Hereford to become an Assistant Curate – a Deacon, a Servant – in the Church of England. That path was the culmination of four years of prayer and exploration of what it was that God had in store for me. There’s no one path to finding what God calls us to do. There’s no neat way that enables us to see the path before us other than to ask God to show us. We often talk about ‘vocation’ in the Church. We generally use it as code to mean a process by which somebody becomes an ordained minister. But vocation is really the action of God’s love through us each and every day – and finding what that action is, is at the heart of figuring out the path God gives us. So how do we even start to discover that path? We start with prayer. We end with prayer, everything that God wants to share with us he does through the sacrament – through communion – and through prayer. As we spend time with God we discover the spark of His love inside us and as we fan those flames we start to discover what it is, or who we are called to be. It could be ordained ministry, it could be teaching, nursing, becoming a doctor or a carer – all those roles that we already understand as a kind of vocation – but there are other things that we’re less good at exploring and being open to. It could be that you’re called to be a good neighbour, or to be the person who smiles when others frown, or to be the person who holds the hand of somebody who is frightened. Whatever it is that God has in store for you – try to find it. Be still, know that God loves you – that His spark is inside you – and fan those flames with prayer and with the sacrament. This morning I delivered my very first ‘Thought for The Day’ – it was a little scary… It’s a short reflection on death, autumn, the continual gifts of death and the presence of God. At 4pm this afternoon I will be preaching at a memorial service at Holy Trinity in Hereford. 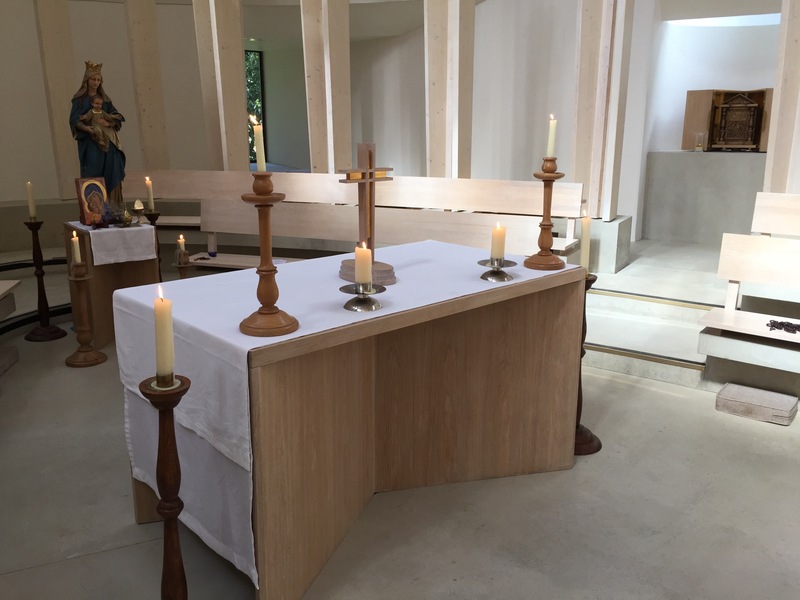 This service takes place twice a year and we invite those who have lost people in the previous six months to come, sit, be quiet, to sing, to pray, to light a candle and to give thanks for the lives of those loved ones who have died. At this time of year it’s especially moving, we’ve just celebrated Halloween, then the day after – All Souls Day and then All Saints Day. You’ll hear stern warnings from some Christians of the danger of what Halloween has become – and there’s strong truth in that – but what follows – All Souls Day – is at the heart of a week of remembering the dead – at the heart of a changing season around us. Now autumn is my favourite time of year. Leaves fall, fields are bare, we are past the rush of September. There’s a peace in this week of All Souls that allows us to take a breath, to see the beauty of what is around is, what is now dead or dying and to take in the great gifts we have had from that bounty. The food from the fields, the beautiful vistas of the countryside, the fruit from the trees… the cider in our cups. But, Autumn – death – continues to give us gifts. As the evenings draw in, the clocks go back we start to shiver at the colder weather we start to see frost on the windows, it feels a good time to remember those who have died. We can recall our loved ones with a smile, we can remember that phrase they used, the way they made tea or the way they told us off. We can smile, but that memory is tinged with the sadness of loss, those memories are sometimes bad or hurt, there are tears – there is pain. Leaves fall. But just as we see the beauty in those fallen leaves we should embrace the pain of our loss and in doing that we accept that whilst our loved ones are gone, we understand that they are not gone forever. That they are loved by God and that just as Autumn goes through the pain of winter – spring always comes. God looks for us in the firmament of heaven, knowing the pain we are in and offering us a warm hand – here on earth right now we feel that as just the tiniest hint of a warm breeze on a cold autumn day – compared to the full-blown howling love that awaits us in death. So as we leave Halloween, all souls day and all saints day behind, appreciate the warm breeze, appreciate the good and bad memories of those who have died – and know that whenever you need it, in pain and in happiness – God’s warm hand is always there to be held – all you need to do is reach for it. I’ve been moved to post this because of the excellent piece posted over at pickingapplesofgold.com ‘Top Tips of starting #vicarschool‘ – In part because I enjoyed the piece so much and also in part because I disagree with a small bit… and there’s nothing like a minor disagreement to urge me into writing. So here are my Top Tops on starting (or continuing) in theological college. I’d like to say these are in order, but one of the big things I’ve learnt at theological college is that priorities are different – so take them in an order which makes sense for you. 1 – Figure out your prayer life – quickly. Prayer life – it’s different for everyone. Figure out what connects you to God. One of the biggest things that shifts in school is that you’re now expected to fit in with the prayer life of the community. This is amazing – it’s a real gift to sit in chapel or church with fellow ordinands and to experience corporate worship. But then, things start to niggle you. What was sweet when you first arrived starts to distract from the worship, those people that you loved to pray with at the start of term quickly become the people that stop you ‘getting what you need’ from the worship. The guitar grates, the organ is overpowering, the people who bow in odd places, the people who raise their hands… these things become all important – and distracting. The hardest lesson to learn is that the corporate worship at theological college isn’t for you – in the person of YOU – it’s for everyone, all over the world. The fact that you have to sit through another 45 mins contemplating a conker and what that means to you on your journey should not distract you from the fact that corporate worship is there to bring us together in prayer and praise – and sometimes we get nothing from it – but that’s okay. If you enter college and your ONLY path for prayer is the corporate worship you are going to find yourself frustrated very quickly. Figure out what you need to help develop your own relationship with God and build on it – take from other examples of worship and prayer – develop – but have something that helps you. For me it was the rosary – something I’d only prayed with in passing before I came to college but something that I now rely on when things get tough and I need time with God in prayer. For you – who knows – but figure it out and hold it dearly. Your own prayer life is not that of the community. 2 – Good enough – is not good enough. When I first started I lost count of the people who told me ‘it’s okay, all you need is a 40 to pass and that’s good enough‘. Over the past two years I’ve watched as people have played chicken with the pass mark, ‘how close can I get!’ It’s tempting. To dismiss the academic work as unimportant, as a distraction from the ‘real’ work of formation. That another essay on a dead german theologian (we’ve all been there) will quite possibly kill your vocation. Trying to do well academically is an outward sign of your inward attempts to connect with those who have gone before us. The reality is very different. True, your pass mark isn’t going to determine where your Title Post may be – but it will certainly come to bare when you’re looking for an incumbency or in a few years time when you decide you’d like to study a specialist area in more detail – all of a sudden that 41% is a hindrance you could do without. But what if you have zero interest in academic matters and have no intention of doing further work – why should you bother to do more than the absolute minimum? Because God doesn’t call us to be ‘good enough’. We are called by God to be Priests, to be ministers of The Word and of the Church and if we want to exercise that office to the best of our ability then we need to understand where we come from, what previous generations have thought, what other people have said about complex areas of doctrine. People have dedicated their lives to answering these questions and we are arrogant if we think that when somebody asks us if they are going to Hell because they stole something that we can answer them with integrity and humility if all we have to draw on are the bare essentials of a ‘good enough’ education in theological college. When we were in school we were always told that you would never know when you may need this theory or that theory but some day we would. My experience in life has told me I have needed algebra, I have needed French I have needed a lot of those things – but most importantly I have needed a mix of them that I could not have understood whilst I was a student. Your theological education is the same. To be humble in the face of your office and your parish you should be able to draw on a depth of knowledge and understanding that has centuries of thinking behind it – and not what you can come up with in the five minutes it takes you to make a cup of tea. *This is of course not to say that the rest of your life in theological college isn’t important – the important element is to have a good mix – your family life, your spiritual life, your prayer life, your academic life – and to dismiss any elements of that as unimportant and to only do the bare minimum is damaging to your formation. For full disclosure my floating average is somewhere between 55-60 – I’m desperately trying to get that up over 60, especially in my third year, but I also have to accept that I want to spend time with my wife and son and that I need time set aside for prayer. 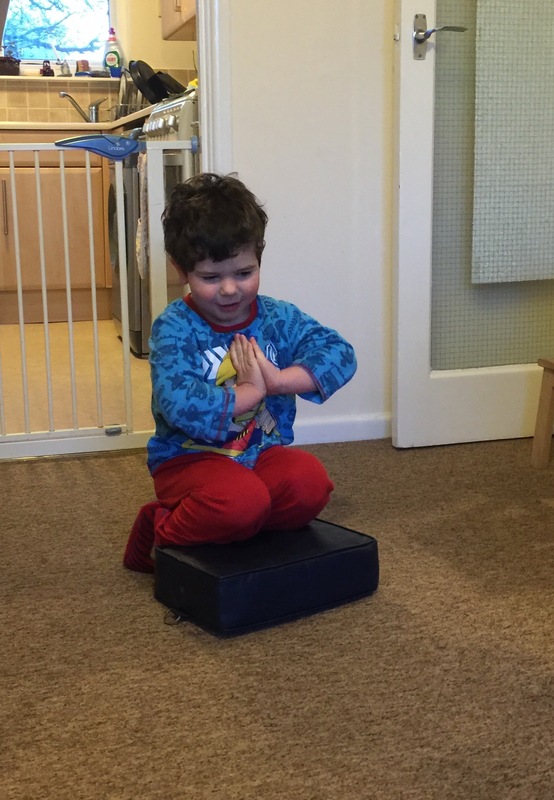 3 – Find a balance – it changes. Finding the right balance is important. Being with your family is as big a part of your formation as spending time in prayer. When you start college the life becomes all encompassing. There is something to do all of the time – study in the library, go to worship, go to lectures, attend a tutorial, sit and pray. Often this means that your family get left behind. Be open with your family about your excitement and wanting to be part of the college life, but be open in return to your family and make sure that you are balancing things well. Only you, as a family, can figure out this balance. Advice from outside will always be from the perspective of another family and what works in one place may not work in another place. Be open to your family and ask them to be open with you. Love them with all your heart and be there for them – even if that means spending an hour less on an essay than you’d like, or stopping reading something interesting, or skirting an optional prayer group. During theological college a lot of things will shift for you. What you thought was important before suddenly becomes unimportant, those things you dismissed six months ago are now shown in a different light. This can have a huge impact on your mental health and you should be alive to that. Most colleges offer counselling in one form or another as a separate discipline to spiritual direction – take up that offer and use it – your family will thank you for it – and so will your bar bill. If you don’t have a spiritual director – get one. Your college can help you get hooked up and if that fails there are other organisations who can help. Spiritual guidance through formation is important – and it is vital that you get input from outside the college bubble. You don’t need to own ALL of the books. But a good and growing selection is a real help. Buy all of the books. I’m kidding. Books can be horrendously expensive but the joy of shelves filled with books is one of the greatest pleasures on earth! I am a bit of a book person and I love the physicality of them. I have a growing theological library that I index on LibraryThing. If I bought all of these books new I would have gone bankrupt last year – but you can buy most of the books you need second hand from places like AbeBooks for pennies. The vast majority of my library has cost no more than £1 and in may cases 75p. There are book grants available from people like Sons of the Clergy or the Dearmer Society etc and you should make use of them. College libraries are for the most part excellent – but sometimes having a copy of the main book the course is being taught from is far more helpful than a copy from the library – especially if like me you like to write in the margins. When it comes to essays I get most of the books I need from the library, then if one of them particularly grabs me I’ll go and buy a copy so I can pull it apart at my own pace without keeping it from someone else. Try to buy your books from an ethical place. Try to avoid Amazon. Consider Waterstones, Blackwell’s, AbeBooks etc – all of these guys match Amazon on academic texts (especially Blackwell’s who are an academic specialist) and often they are cheaper. Keep your eye open for Church House specials – as they’ll often be significantly cheaper than Amazon. The ability to pray for love is the greatest gift God gave us. At some point over your time in college you are going to absolutely loath somebody. It could even be yourself. It’s going to happen, you can’t help it. In the rarified atmosphere of a theological college that loathing can spread and grow and deepen to the rest of the community. When you find that happening you need to do something that my spiritual director calls ‘aggressive loving’. Aggressive loving means praying for that person every single time you pray. You pray for their love in return for yours and you pray that they are happy in God’s love. It’s amazing how quickly loathing can turn to love when you pray for somebody. It works. I do it a lot. 8 – There is more to this life than theological college. Get out. Go. Do not for a moment forget that your life now exists in a bubble in a world that is very different from that going on around you. You’ll find your language changing, your outlook shifting – everything – and then when you re-enter the real world it can come as quite a shock. It’s like going to Hogwarts as a muggle but then finding when you leave you’re only allowed back into the muggle world. So get out. Go out with friends who are not connected with the church or with the college. Read different newspapers and websites. Spend at least half a day outside of your college each week. Go away in the holidays – even if it’s just a caravan two miles down the road. Don’t lose touch with the rest of the world. Understanding who your friends are – not just in college but before they came – and what they may be afterwards is a gift. 9 – You are surrounded by clever people. Before you came to college you probably had a life doing something different. You may have gone to university, or had a job, or raised a family or any number of things. Remember that everybody else did as well. It’s easy to fall into the trap that leaves you thinking you are surrounded by people who are only measured by how good the last piece of worship they organised was. Get to know what people’s skills and abilities are and talk to them about it – share yours – you’ll be amazed at how many cool, clever people you are surrounded by. The friendships you generate in college will support the rest of your life in ministry. Don’t allow yourself to only see people in one dimension. 10 – Leave the conkers where they are. Conkers don’t need to be in worship. They are beautiful under the tree where they fell. Please don’t give me one as I walk into church. What did I want? I wanted a Skype virtual number that worked with the Skype client on my iPhone, my laptop and importantly – with a desktop phone that would function without the need to be plugged into my computer. Easy. Google Skype desktop phone and you’re presented with an array of options. But here’s the rub. They don’t work. Skype – the consumer version – is just not wired to work properly with a stand alone desktop phone (VoIP) – so you’re going to have to try something else. I now have a virtual Skype number that calls through on my various devices as well as a desktop phone – this is how I managed it – it took me the better part of two weeks of on-and-off work to get this up and running – there is so much contrary information on various websites that I hope this offers a clear path for new users. 1 – Skype wont work for you. The personal version of Skype is not up to this task. Yes, you can buy a USB phone for your computer but it’s barely better than a bluetooth headset and it still requires your computer to be up and running and signed in. You need Skype For Business. It’s designed to work with more robust VoIP systems and will integrate with a number of desktop phones – most easily with this range from Polycom. 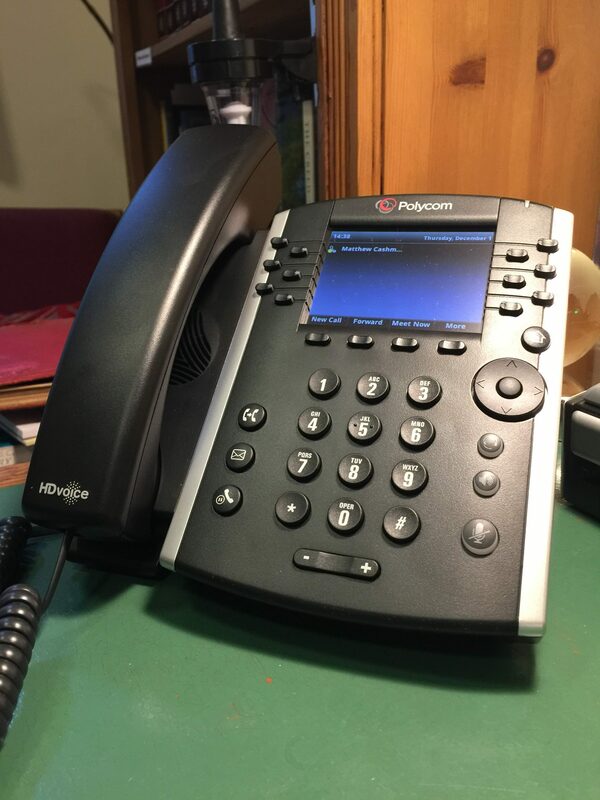 Be aware you need a very specific version of the Polycom phones that come with the relevant firmware pre-installed. This is important. Without that firmware the upgrade process for these devices is a pain – a REAL pain. I know. Skype for Business is an awesome stand-alone tool. It’ll ring your devices, is far more robust than the personal version and offers good value for money. You could stop right here with a simple subscription and forget the desktop phone idea. You are set to go – you need ALL of these things. Skype For Business will not work on a desktop phone without this set up. 4 – What’s the cost? An office E5 licence sets you back £25 per month. But for that you get the entire Office suite of apps and a bunch of other things that made it worth while for me. Domestic call plan is about £7 per month – but can vary depending on your Office Licence. You can chop and change these licences depending on your needs as long as you have the three items listed above in some form or another. Buy a Polycom phone. It arrives with the firmware installed and you just log in via the web interface, insert your Skype For Business credentials and it just works – honestly, this was the easiest part of the whole thing. There’s a bunch of help online if you get stuck – but it really is straight forward. My phone calls just like a real phone, it receives calls easily and as Skype For Business becomes more integrated into the Office suite of tools it becomes ever more useful as a desktop device – contacts, calendar, diverting and transferring to other members of my team etc. 6 – Do you really need a desktop phone? If you really need a desktop phone this painful path is worth it – because you’re essentially setting up a small commercial set up with Microsoft. It works really well once set up but a lot of it is for IT pros and not for the likes of you and me. If you don’t really need a phone, you may well find the cost and set up just too much – stick with your iPhone and a bluetooth hand-held for your desk. Now I’m set up I have incredibly robust email, access to Microsofts Office Enterprise tools and software and integration across all of those tools. I can easily manage my own email server and my own phone server. This is such a good tool. Sermon on Ephesians 1:3-14 – Spiritual Blessings in Christ. July 13, 2015 / Matthew Cashmore / Comments Off on Sermon on Ephesians 1:3-14 – Spiritual Blessings in Christ. This month I am on placement at St Mary’s in Princes Risborough. It’s an amazing church and this is the first time that I have preached a sermon there… I struggled a lot with this sermon because I couldn’t get my head around what Paul was trying to say – it took an incident in the previous week (you’ll have to listen to find out) to shine some light on what was going on. I’m really pleased with my delivery and message here – I spoke far too quickly in places but.. being Welsh I am prone to that. Please do listen and let me know your thoughts. There’s no script as such for this sermon because it was delivered to an Evangelical congregation and it would not have been appropriate to stand in the pulpit – but below you’ll find my initial notes as I tried to pull together my thoughts. It has very little connection with the sermon that was preached so you’ll really need to listen to it to take away the message. When I put this reading down it started me wondering about the world ‘blessed’ about what it means when community has discovered the depths of what it means to be ‘blessed’ – a joyful baptism, the deep joy of taking part in a community effort to help others in some way or forgiving others… it’s the joy we feel at a funeral – that’s an odd thing to say but it’s the deep sense of blessing we encounter knowing that despite the sorrow death does not have the final word. What does it feel like when we live up to this God-given vocation as a community of blessing? We exist as Churches to bless our neighbours – near and far – a powerful powerful counter-testimony agains the widespread view that christians are only interested in judging and saying no to people – not blessing them. It’s all very easy to say but what does that look like – what does a church doing this look like? Well it looks very much like this church that’s for sure – but let me give you another example. It’s full of sorrow and pain, the worst thing that could ever happen to a Church congregation – the shootings in charleston. A man walked into a bible study group, to a group of people who had opened their arms to him and then he shot them. He opened fire and killed, maimed and damaged people that had held him in love. In a country where this kind of thing happens far too often I was waiting for the inevitable responses. The hatred. The stone throwing. The political ‘debate’ whilst the Church that had been damaged was left to pick up the pieces. They did that – they started to pick up the pieces but you know what they did? They recalled what it meant to be given the spiritual gifts of Christ, they remembered that we are all adopted by God – even those who are not ‘in our gang’ and they went to his initial hearing. In the states victims of events such as these are allowed to address the court as victims – these are usually extremely emotional. People tell their stories and then they ask the judge to put this person away for the rest of their lives or worse – they ask the judge to kill this person. I was waiting for this, I was waiting for the hatred – but what I saw was a spiritual outpouring that left me crying in front of my computer. I watched as the man who was arrested for the shooting stood in front of the court via a big screen and I watched as each victim, each person who had lost someone stood… they told their stories and then they forgave him. Over and over and over again. Every single person who stood in that court forgave him. THAT is what it means to be blessed through Christ. That is what Paul is telling us in this reading. That is what we must live every single day in every single thing that we do. I’ll tell you another story. I was sat outside Lacy Green School. I was parked quite near a corner into a side road and I was early for our assembly. I was reading todays reading, starting to think about what I was going to preach about… a van pulled up next to me and he had a go at me for parking so near to the corner. I put my bible down and I just looked at him – he had disturbed me, how dare he- doesn’t he know what I was doing! I was doing work for the Church and this guy, this person who’s not in my church DARES to disturb me! So I replied calmly but incredibly rudely that he must be confused because he was talking to someone who didn’t care what he thought. The guy hit the roof – he went nuts – he called me everything under the sun, he swore, he called me fat he went balistic – but I didn’t care – who was he to tell me what to do? who was he to shout at me – I just looked back at him smiled and waved – it’s fair to say he got even more mad… then he drove off and I picked up my bible again. Then it struck me – um… what a complete… well what a dreadful person I had been… here, right here in this reading I’m being told we are all one because of Christ and here I was throwing things at someone – I wouldn’t have done that to any of you guys and none of you would have been rude to me in the first place because we are all nice to each other because we’re all part of this Church – but this reading tells us we are ALL one in Christ we should live that example every day with every person. As I pondered this I reversed the car away from the corner and started to regret my behaviour, I said a prayer – in fact I took out my rosary and prayed for forgiveness…. I got forgiveness – the chap in the van came back. This time I had my bible on the seat next to me and my rosary in my hand – I looked up and here he was in his van coming towards me. He stops next to the car, gets out and… well… he says sorry for being so rude to start with and that he felt dreadful about it. I took his hand and I said sorry to him, then I gave him a hug and with tears in our eyes we remembered that we were both men and men don’t do this kind of thing so we nodded to each other got back in our respective cars and parted company. When we open ourselves as Christians to the spiritual gifts given through Christ then we remember that these gifts are given to everyone and then maybe, with prayer, we’ll get to experience that blessing, that joyful blessing in Christ.